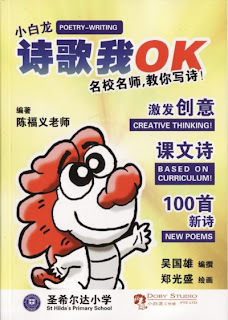 Josh Laboratorie: 诗歌我OK - 1st illustrated book! I just came back from Surabaya, Indonesia; a couple of days ago. It was really a very rewarding trip. Will be posting up some pictures soon. Well, this is it. My first illustrated book, 诗歌我OK. It contains many specially chosen chinese poems done by St. Hilda's Primary School's students. This book is cater for childrens who wish to learn and improve their Chinese creative writings. There are practices and tutorials at the back which teaches how you can express yourself through writing Chinese poetry. The tutorials are easy to follow. The cover art is done by my Studio Chief, while the rest of the drawings in it were done by me. Although, I feel that the drawings were nothing spectacular, but well, its my FIRST! So I'm still feeling kinda excited about it. However, I need to work on my drawings to be better and faster~!I'm thankful for the opportunity to draw the book though. 诗歌我OK will be out in all Popular Bookstores islandwide by end of this December 2009. The cost of the book is price from $5-$6 Singapore Dollars. If you have managed to get it, do drop me an email and tell me what you think! I'm currently doing another book, it would probably be out by January. So do keep a look out! More updates soon!